Due to Arthur’s newfangled shenanigans, Wednesday’s Jeopardy ended in a rare tie. 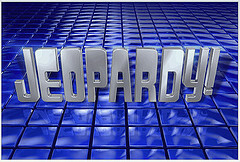 In Final Jeopardy, the leading contestant typically wagers $1 more than double of the 2nd place contestant. If both answer correctly, then the person in the lead wins by that extra buck. But Arthur did not add the $1, wagering enough so that if he and Carolyn both answered correctly, they would tie. And that’s exactly what happened, as both moved on to the next round. He made the same move on Tuesday, as well, though he was the only contestant to answer correctly. “Interesting wager,” host Alex Trebek condescended, after the tie. While it seems strange, it’s actually the correct move to make, says The Final Wager blog, the brainchild of former Jeopardy winner Keith Williams that breaks down the proper mathematical wagering. Basically, the whole point of the game is to move on to the next round. Whether or not someone joins you is largely irrelevant. In addition, there’s a certain mind-game tactic that can make the trailing contestant bet an irrational number. While the numbers stand behind these ideas, Tuesday’s tie-targeting move was the first to do so all season, Williams said. “It’s really cool to see this happen,” he said. In fact, Arthur admitted to Williams that he got the idea from his videos. Are you actually allowed to bet an irrational number? Had this strange feeling when I watched the episode that he made the tying wager because he wanted to keep the attractive woman on the show with him. I noticed this as well as soon as it was over and saved it on my DVR for review. I don't think there was any game theory or any other related rational theory applied in this situation since why would you want an at least pretty good player around to go up against you again the next day? I actually think the only theory that could be applied here is that Arthur is a far from handsome funny but chubby Asian dude and the person he essentially allowed to get a lot of cash on behalf of the Jeopardy empire so that he could be around a reasonably hot chica for another day-one he almost had a 0% chance of landing even a date with in real life. The attention paid to this is absurd. Lots of players jump around the board trying to grab the Daily Doubles and eat up the big value questions. And there have been intentional ties in the past. I guess the internet makes ignorance of something "new" and "exciting" like Ani DiFranco's song about a fish in a bowl seeing the little castle each time. There an under appreciated risk in the strategy of picking large $$ clues: many category clues are written in a specific style for that category and can be misleading, so if you jump in at the bottom you may lack the needed familiarity you would get from the easier ones at top. This particular guy really relies on buzzing in quickly, not getting everything right. That last part isn't true of only this guy--*every* Jeopardy winner thrives on buzzing in quickly. That's really more important than knowing the answers. I hadn't considered it before reading this article, but I actually like this strategy. Especially if you are fairly certain you can beat the second place contestant again the next day, it makes a very good bet. I would rather play someone I just beat than two unknown strangers. Question: Why would it not make the most sense to risk it all on every final jeopardy question? Second place gets $2,000 regardless of the earning on the show and third gets $1,000. So unless you have more than double 2nd place and can't lose, why not bet it all? Either you get it right and win, or you figure the one of the other two will get the answer right and beat you. Next Post »The Downside of Smoking Pot?